The batter for these healthy peanut butter banana oat pancakes is whipped up in a blender. It’s a quick and easy recipe, which means you can have pancakes for breakfast all week long and best of all, they are gluten-free, vegan, and refined sugar free! Top with mixed berries and peanut butter drizzle for a combination that’s perfectly reminiscent of a classic PB&J. My parents have often told me that when I was a toddler, I had a habit of waking my dad in the morning by poking him over and over in the middle of the forehead and demanding he make me pancakes for breakfast. Personally, I think it sounds kind of endearing, but my dad worked a night shift for a few years while I was growing up, so I don’t think it was a particularly appreciated routine! I still love pancakes for breakfast just as much as my bossy toddler self and this “peanut butter and jelly” banana oat version is one of my favorite ways to have them. I love that this recipe comes together so quickly in your blender (or food processor). Plus, it’s vegan, gluten free, and refined sugar free which means it’s a breakfast treat you can feel good about and eat all week long! To keep this recipe gluten free, I used a gluten free oat flour as the base for the pancakes. Oat flour is also super easy to make yourself at home: simply start with whole oats and grind them as fine as you can in your food processor . I usually do this in batches and keep extra on hand since I love using oat flour in all sorts of baking recipes, like these chocolate chip cookie dough truffles! 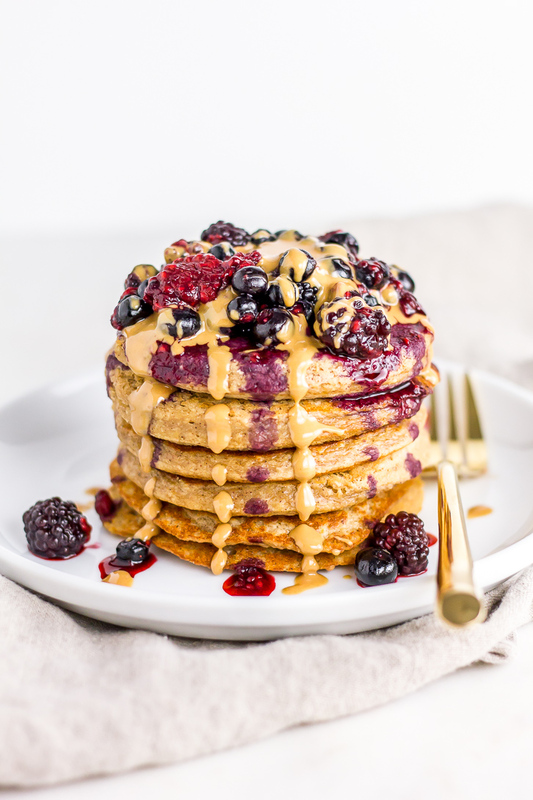 Peanut butter and frozen berries are two absolute staples in my kitchen and they’re the perfect toppings for these healthier banana oat pancakes, since they aren’t overly sweet. I warm the berries up in the microwave to make a quick “compote” and the resulting combination totally reminds me of a PB&J – which happens to be one of my other favorite childhood foods! Warm the peanut butter up in the microwave as well to make it super easy to drizzle on top. This recipe is easy enough for a weekday, but fancy enough for a weekend too, so it makes it into my breakfast rotation regularly. If you have any leftovers, they can be kept in an airtight container in the refrigerator for a few days. If you make this recipe, don’t forget to post a photo and tag @flourcoveredapron on Instagram! And if you’re hungry for more breakfast inspiration (everything from simple to gourmet, healthy to indulgent), check out my breakfast recipes board on Pinterest. In a blender or food processor, blend all the pancake ingredients together until smooth. Set aside to allow the batter to rest. Meanwhile, heat a griddle over medium heat. Lightly grease the griddle, then pour the batter on the griddle about 1/4 cup at a time. Cook each pancake until bubbles begin to form on top and the edges are golden brown. Flip and continue cooking until pancakes are cooked through and golden brown on both sides. Transfer to a plate and repeat as needed with remaining batter. While the pancakes are cooking, place frozen berries in a small bowl and warm them up in the microwave, using 30 second intervals, until the berries have thawed and the juices are released. In another small bowl, warm up a few tablespoons of peanut butter for 30-45 seconds in the microwave. Serve pancakes warm with the berry compote and peanut butter drizzled on top. *If necessary, make sure to use certified gluten free oat flour. You can make your own oat flour by grinding oats in a food processor until finely ground. I’m seriously drooling. These are absolutely gorgeous and totally look like something you’d pay $15 for at a breakfast cafe. But so easy! Can’t wait to try them! Thanks Natalie, I live for weekend brunch! !